Most of the official translations don't need the footnotes, however, with the release of Oregairu and Rokujouma recently, I see the need for it is increasing. As someone who loves to read the LNs with phone and tablet, I usually make my own Epubs. And as you know, many of the fan translations have a lot of footnotes, some even have hundreds of them just for one volume. With the way the books is coded right now, it's really inconvenient to jump back and forth between the text and the note. It's worse with paragraph that has multiple notes in it. 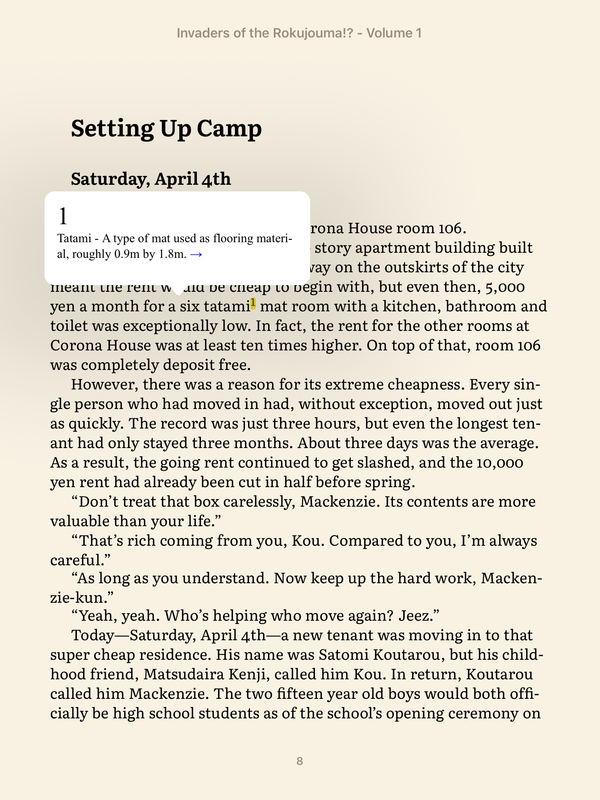 With pop-up footnote, it's much more intuitive as the note will be display right above the text and can be easily dismissed later. The only requirements for pop-up footnotes are Epub3 and the reader that supports it, in my case iBooks on iOS. And with the premium epubs here are already Epub3 so I'm thinking why not take advantage of it. Also, the pop-up footnotes can still be display as normal ones when using a reader that doesn't have support for Epub3 so you don't have to worry about incompatibility. I don't know how the premium epubs are generated here so I don't know it's feasible or not, but it's worth mentioned. @DarKraD Thanks for the tip! Does this cause any compatibility issues with hardware readers that don't support the footnotes features (like kobo or nook)? The only worry I'd have about doing fancy features is if it causes backwards incompatibility. Unfortunately, I don't have any hardware from Nook or Kobo to test it. I can provide a small test epub file with just this section of the book for anyone who has the hardware to test it if it's OK with you. And I've also tested this with many epub readers on iOS that only support epub2, this works just fine. The reader will ignore everything and display the footnotes like normal. @Sam-Pinansky At least Kobo should be fine in this case according to https://github.com/kobolabs/epub-spec#footnotesendnotes-are-fully-supported-across-kobo-platforms, and I'm pretty sure that I've already read a book on my Kobo reader where it worked. @DarKraD I can test with my Nook Simple Touch w/glowlight later this weekend. I will PM you my e-mail momentarily. On the Nook Simple Touch, the footnote was visible and clickable. When I clicked the footnote, the Nook navigated me to the "Notes" section, and also popped up a "Back" button to return me to where I was. I think I can fully approve of this feature - it works, and it's convenient! I'm using Auro H2O, and since all kobo device are practically on the same firmeware cores, footnote should be no problem. I've had Kindle before and the epub->AZW3 should have no problem as well. Finally, footnote did not trigger any warning with Calibre's epub editor's "Check for bugs" feature, so I'm sure it's safe to assume that most, if not all, e-readers have no problem with it.